Skye Bolt has been named the Texas League's Player of the Month for August. The 'Hounds' outfielder hit .351 for the month with nine doubles, one triple, eight home runs and 19 RBI (a .402 on-base percentage and a .723 slugging percentage). After hitting just .133 in April, Skye was reassigned to the (Advanced-A) Stockton Ports. He was promoted back to the RockHounds on June 18 and is hitting .278 since his return, with 10 home runs and 35 RBI. 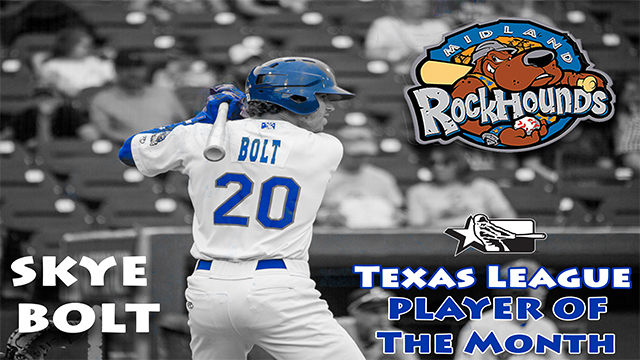 Bolt helped lead the RockHounds to an 18-10 record in the month of August.